Get messy and create your own chocolate heaven with a chocolate making course or chocolate workshop. 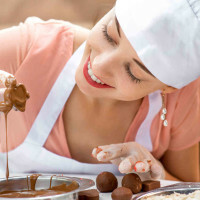 Chocolate making is a fantastic and unusual idea as part of your event. Get messy and create your own chocolate heaven with a chocolate making course or chocolate workshop. Great for hen parties and corporate events or just to have fun with friends, chocolate making is a fantastic and unusual idea as part of your event. Learn new skills with chocolate experts from around the country and get the chance to create your own pralines, truffles, caramels and many more. Just let us know where you want to go and we can make some suggestions to get you going.